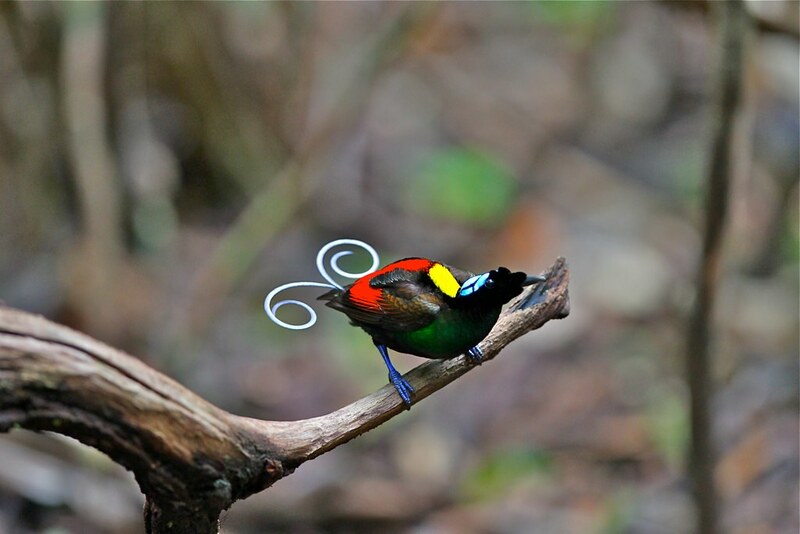 The aptly named “superb bird-of-paradise” is fascinating to behold, especially when it’s performing its courtship dance. In fact, once the male bird opens its plumage, it doesn’t look like a bird at all. The transformation is so complete, so bizarre that all the female sees is a black disk with an electric blue smiley-like face. The superb bird of paradise (Lophorina superba) is a species belonging to the Paradisaeidae family, also known as the “bird-of-paradise”. All members of this family have elaborate plumage and display bizarre courtship rituals. As in other species of this family, only the male superb bird-of-paradise posses the spectacular ornamental plumage consisting of an iridescent green crown, a blue-green “breast shield” that can be erected during courtship and long velvety black feathers on the back that can also be erected to form a cape. The female is rather drab. The species has an unusually low population of females, and competition amongst males for mates is intensely fierce. This has led the species to have one of the most bizarre and elaborate courtship displays in the avian world. After carefully and meticulously preparing a "dance floor" (even scrubbing the dirt or branch smooth with leaves), the male first attracts a female with a loud call. After the curious female approaches, his folded black feather cape and blue-green breast shield springs upward and spreads widely and symmetrically around its head, instantly transforming the frontal view of the bird into a spectacular ellipse-shaped creature that rhythmically snaps its tail feathers against each other, similar to how snapping fingers work, whilst hopping in frantic circles around the female. The average female rejects 15-20 potential suitors before consenting to mate. Other species of the ‘bird-of-paradise’ family are also pretty spectacular. Checkout the impressive spiral tail feathers on Wilson's bird-of-paradise (Cicinnurus respublica). The male Wilson's bird of paradise performs an intricate courtship dance for the female in an ‘arena’ which he must tidy, removing leaves and unwanted items so that his amazing colors will be the center of attention. The ribbon-tailed astrapia (Astrapia mayeri), another species of bird-of-paradise, is so named for its two extremely long, ribbon-like white tail feathers. The bird is about 32 cm long, but its tail can be over a meter long. The male ribbon-tailed astrapia has the longest tail feathers in relation to body size of any bird, over three times the length of its body. The King of Saxony bird-of-paradise (Pteridophora alberti) sports two remarkably long scalloped, enamel-blue brow-plumes that can be independently erected at the bird's will. The male's ornamental head plumes are so bizarre that, when the first specimen was brought to Europe, it was thought to be a fake. Checkout the Birds-of-Paradise Project for more information, pictures and videos about these magnificent birds.